Objective: A new topographical filter in a dermal administration patch that organizes water molecules has been suggested as an alternative treatment for manifested tinnitus. The aim of this study was to evaluate this patch in a pilot study. Materials and Methods: 12 patients were included (10 completed) in an open study all receiving treatment with daily changed patches. The objectives were to evaluate safety and performance of the patch during and after treatment. The primary objective was to evaluate the tinnitus severity (by Tinnitus Severity Questionnaire, TSQ) and tinnitus annoyance (by Visual Analogue Scale, VAS). The secondary objective was to evaluate if the patch could improve the patient’s quality of life (by SF-36 Quality of life questionnaire) and sleep initiation time (self-rated). Results: At visit 4, after 21 days of treatment, an improvement (decrease in TSQ score) was seen in 5 responder patients, which was sustained at the post-treatment visit. A marginal increase in TSQ score was seen also initially in 5 non-responder patients, 4 of which were responders post-treatment. The rated tinnitus annoyance, quality of life and sleep initiation time did not show significant changes. The safety evaluation did not present any safety concerns. Conclusion: This small pilot study indicates that it can be reasonable to recommend on a risk-benefit and safety perspective treatment with the dermal patch to patients with tinnitus as a consumer product based on the lack of other effective alternative treatment. Further and larger studies, and also proven experience, are recommended for stronger evidence. Tinnitus is generally described as a conscious perception of sound located in the head or in one or both ears in the absence of a corresponding external stimulus. It can be sub-grouped as subjective tinnitus, the individual alone experience it, or, much less common, objective, when a different person, an observer, can hear it . The prevalence is approximately 10%  which means that it affects many in a population. There are a number of factors that are known to increase the risk of developing tinnitus such as hearing loss, exposure to noise, mood disorders, facial muscular tensions, especially dysfunction of the temporomandibular joint and many drugs including salicylates and some antibiotics [3,4]. The pathophysiological mechanism behind tinnitus has been broadly discussed and still remains unclear even if it is widely recognized as of central (CNS), not peripheral, auditory system origin. The patient awareness of the sound is interpreted as external sensation, but is in fact, caused by the brain or by abnormal nerve signaling to the brain creating the basis for hypersensitivity and hyperactivity . Different neurophysiological models like aberrant filtering of auditory information by limbic regions , neural synchrony as with phantom perception , and spontaneous nucleus hyperactivity  has been suggested. The fact that most forms of tinnitus are disorders of the CNS in interaction with environmental cues put emphasis on neuroscience and how urban settings, sounds and electromagnetic fields induce physiological distress [5,9] while on the opposite, nature fractal symmetric cues has an involuntary and adaptive restorative capacity and influence on the CNS . Many treatment alternatives have been suggested and tried over decades but no treatment or therapy have shown any strong significant positive results. To summarize multi database search (Cochrane) analysis of sound therapy (masking) failed to show efficacy , treatment with anti-depressant or antiepileptic drugs failed and could also give serious side effects instead [12,13]. Ginkgo Bilobo had no positive effect , and cognitive behavioural therapy (CBT) had no effect on the annoyance of tinnitus but a slight improvement in depression score and quality of life . Tinnitus retraining therapy (TRT) is a popular treatment method of today. It comprises a form of educational counselling and sound therapy given according to a specific protocol. TRT is widely given in many countries and consume healthcare assets and long-term patient attention but the scientific evidence for symptom relief was found surprisingly weak . The need for alternative treatments is obvious but preferable not invasive and potentially harmful ones . The topographical filter dermal administration patch is a new Swedish innovation with a patented raster that generates a fractal light with higher organization that affects the cells via its water content . This might have a stabilizing effect on the sound’s transportation and generation dedicated cell elements in the auditory system. Case reports (unpublished) with this consumer product have shown a remarkable alleviation of tinnitus, even for patients with many years of suffering and refractory to other existing treatments. This treatment open study was ethically approved  and independently monitored including visiting reports. All included patients received the topographical filter patch in a design following clinical recommendations . The objectives were to evaluate safety and performance of the patch. The primary objective was to evaluate the tinnitus severity and tinnitus annoyance. The secondary objective was to evaluate if the patch could improve the patient’s quality of life and sleep initiation time. Patients suffering from tinnitus were recruited voluntary from the ENT clinic patient database and from local advertisement. • Patients who have started treatment or made changes in treatment with drugs known to influence tinnitus within 6 weeks before study start. The clinical performance assessments were performed at screening visit, baseline visit, at the 3 week visit and at the 4 week post-treatment follow-up visit. Between the baseline visit/start of treatment and the 3-week visit/end of treatment, there were 2 telephone follow-up contacts after 1, 2 and 7 weeks (Tables 1 and 2). The performance included Tinnitus severity questionnaire (TSQ), patient diary including numerical ratings of tinnitus annoyance, sleep evaluation (minutes to fall asleep), and SF-36 Quality of life questionnaire . All visits were carried out by the same ENT physician together with a research nurse to elicit relevant information. The patients received at baseline visit one package of 21 topographical filter dermal patches, instructed to change the patch every day for 3 weeks during the study. 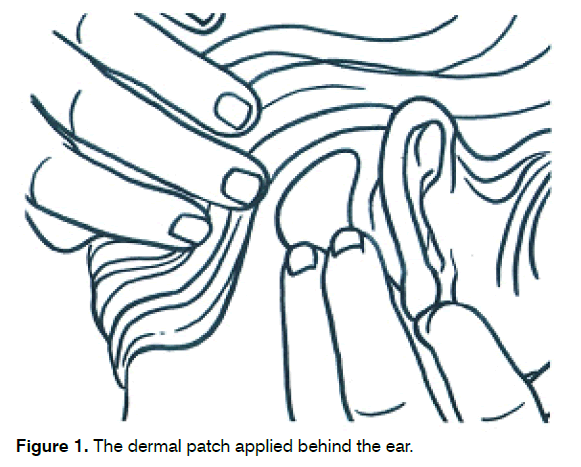 The patients applied the patch behind the most tinnitus affected ear or if symmetrical behind random chosen ear (Figure 1). The packaged was stored in room temperature and allpatients received treatment from one batch. The TSQ includes 10 items, each yielding a score from 0 to 4, according to the degree “not affected” to “always affected”. The TSQ is a self-rating instrument with 5 levels and scores continuously from 0 to 40. TSQ include items concerning general tinnitus severity, quality of life, and psychological aspects of tinnitus. The numerical rating measuring tinnitus annoyance is a visual analogue scale (VAS) with a 10 cm scale and supporting sentence given at each end. The subjects were instructed to choose a number from 0 to 10 that best described their current tinnitus annoyance, where 0 would mean “tinnitus does not annoy me at all” and 10 would mean “unbearably annoying tinnitus”. The SF-36 consists of 8 scaled scores, which are the weighted sums of the questions in their section; physical functioning (PF), role limitations due to physical health problems (role physical, RP), bodily pain (BP), general health (GH), energy levels/fatigue (vitality, VT), social functioning (SF), role limitations due to emotional problems (role emotional, RE), and psychological distress (mental health, MH). Each scale is directly transformed into a 0-100 scale on the assumption that each question carries equal weight. The patient diary was administered to each patient at the first visit. The patient was instructed to make daily numerical ratings of tinnitus annoyance. In addition the patients were asked to rate the previous night’s sleep initiation by answering the following question: “How long time in minutes did it take to fall asleep last night: 0-15 min, 16-30 min, 61-90 min, more than 90 min”. Adverse events and changes in concomitant medication were recorded continuously and at each visit until resolution of the event. All data was recorded on individual case report forms and subsequently entered into a database. Table 1. Schedule of events in study design. Table 2. Schedule of events in study design (continuation from Table 1). Figure 1. The dermal patch applied behind the ear. Almost 2 years after the study a follow-up was conducted. A written post market form was sent to the 10 patients treated in the study. The question was if they could recommend or not the treatment to other patients with tinnitus and if they had a sustainable relief of their tinnitus or not. The topographical filter dermal administration patch is a consumer product (Antinitus, Akloma Tinnitus AB, Stockholm, Sweden) intended to relieve tinnitus sensations. It is based on a non-invasive raster, refracting light through a specific topological geometrical field structure, which makes photons of light self-organize . This process creates a field-like unification of water molecules, thus affecting the biochemical outcome within cells18. Incorporated in the patch, to be attached behind the ear, the matrix is considered to affect the configuration of extra and cellular water. The presence of fractal non-linear mechanisms and long-range, power-law correlations, which aligns a quantum coherent regime of physiological water as an important factor in the emergence of selforganization and self-consistency of the living organism providing a mechanism for its non-locality [23,24]. By these structural changes the auditory system might be affected. All data was to be presented descriptively. Each patient was its own control. Statistical analysis was performed by analysis of variance (ANOVA) and the Statistical Package (StatXact, version 10.1, Cytel Studio, Cambridge, Massachusetts, USA). 12 patients were included in the study, 7 patients with unilateral and 5 patients with bilateral tinnitus. 6 female patients and 6 male patients were included. The mean age of the patients was 54 years, with a range of 36 to 69 years.The ear and dermal examinations and the medical status were all normal for all patients at study entry. 5 patients had an abnormal audiogram result (mild hearing loss) at study entry. 5 patients had relevant medical history that could be related to tinnitus, such as neck discomfort, temporomandibular joint discomfort, and bruxism or other. The tinnitus duration was ranging from less than one year (2 patients) to one to 5 years (4 patients). 6 patients had tinnitus duration of more than 5 years. One patient had received prior tinnitus treatment. A total of 9 patients reported at least one concurrent disease at study entry. The 3 most commonly reported concurrent diseases in addition to tinnitus were headache in 5 patients, hypertonia in 3 patients and hypothyreos in 2 patients (Table 3). Table 3. Demographics of included patients. 10 of the recruited 12 study patients completed all visits. One patient withdrew after 6 days of treatment due to increased tinnitus and a local dermal reaction (used acetone for dermal cleaning which was not recommended). Tinnitus severity decreased within one day after removal of the patch. One patient withdrew after 4 days of treatment due to increased tinnitus. Tinnitus severity decreased within one day after removal of the patch. One patient discontinued treatment after 17 days but completed all visits and was considered eligible for efficacy analysis. A total of 19 adverse events were recorded (10 patients), no events were severe. 4 adverse events were possibly related to the product (3 patients) and 15 were non-product related (9 patients). The related adverse events were: increased tinnitus symptoms (2 patients), dermal reaction (1 patient), and a sensitive feeling behind the ear but no visual dermal reaction (1 patient). All cases of increased tinnitus appeared within 4-17 days after start of treatment and were resolved within 2 days after interruption of treatment. Patients with a decrease in total score of the Tinnitus Severity Questionnaire (TSQ) over time comprising the post-treatment visit were considered responders and patients with an increase in TSQ were considered non-responders. Because tinnitus likely has different subgroups, and because tinnitus affects people differently, data analysis should emphasize individuals not groups20. The subjects of the primary responder group were mainly non-chronic tinnitus patients or patients with no chronic concurrent diseases. At visit 4, after 21 days of treatment, an improvement (decrease in TSQ score) was seen in 5 responder patients, which was sustained post-treatment (Table 4). A marginal increase in TSQ score was seen also initially in 5 non-responder patients, 4 of which were responders post-treatment. The change over time was statistically significant in responders during treatment and post-treatment and from a 95% confidence interval for the proportion of the increased number of responders post-treatment. Importantly, the sustained effects in responders after the 4 weeks washout period, signifies a clinical subsidence of tinnitus sensations different from the placebo effect. Studies published on the effect of placebo are conclusive and describe that the placebo effect has a short short-term perspective with normal duration of minutes or hours up to a few days . Several placebo-controlled studies on drug treatment of tinnitus with significant tinnitus reduction different from placebo followed a 3 to 4 weeks regimen, one week washout and 3 weeks of placebo [5,26]. The result also indicates a tendency of a more rapid onset of treatment effects in tinnitus patients absent of concurrent diseases. Although, that the result shows significant treatment effects on responders at visit 4, which was sustained post-treatment, the duration of treatment was insufficient to completely dissolve tinnitus sensations. However, the result confirms the aim of this study, which shows significant and sustained efficiency in treatment outcome in responders according to TSQ score. Table 4. Difference in total score of Tinnitus Severity Questionnaire between Visit 1 and Visit 4, Visit 1 and Visit 5, and Visit 4 and Visit 5. * Pat.no. 002 and 008 had no values after baseline. At visit 4 (end of 21-day treatment period), an increase in time to sleep was seen in 3 patients. For 6 patients, no change was detected (Table 5). The change from baseline to visit 4 was not statistically significant (sign test paired variables, p = 0.25). Table 5. Sleep initiation rating scale from baseline to visit 4 and 5. 3 patients showed improvement in the tinnitus annoyance scale. Spearman rank correlations for individual patients showed statistically significant improvement for 2 patients. However, three patients showed an increase in values, Spearman rank correlations showed statistically significant change for one patient. Five patients showed no change. The change from baseline to visit 4 was not statistically significant (sign test paired variables, p = 0.45). The change over time was not statistically significant (Friedman ANOVA p = 0.67, one-way repeated measures ANOVA p = 0.32) (Table 6). Since there is no consensus concerning the best measure presenting features of tinnitus or the effects of tinnitus treatment, the tinnitus annoyance questionnaires were not originally developed to maximize their sensitivity to treatment-related changes in tinnitus . The limited correlation between tinnitus loudness and the perceived annoyance measures, points to an important role of non-auditory factors such as emotion or attention in perception of tinnitus sensations . In the present study, the tinnitus annoyance scale aimed to measure an estimate of the ability of the questionnaire to measure the changes associated with the treatment. However, effectiveness of the questionnaire was sufficient to measure the outcome in 3 out of 10 patients. Table 6. Total score of tinnitus annoyance scale from baseline to visit 4 and 5. There were only small changes in the SF-36 variables and the change over time was not statistically significant (Friedman ANOVA) (Table 7). Physical functioning (PF), role limitations due to physical health problems (role physical, RP), bodily pain (BP), general health (GH), energy levels/ fatigue (vitality, VT), social functioning (SF), role limitations due to emotional problems (role emotional, RE), and psychological distress (mental health, MH). Table 7. SF-36 items from baseline to visit 4 and 5. 9 out of 10 patients reported back with the written post study market follow-up form after almost 2 years and 4 patients of 9 would recommend the treatment to other patients with tinnitus and 3 patients of 9 reported a sustainable relief of their tinnitus. No further adverse events related to the treatment were reported. As concluded previously in this article tinnitus is difficult to treat and there is currently no cure for tinnitus. As tinnitus largely is subjective it is also a challenge to find objective methods of measuring improvements, and there are very few studies previously reported in literature that could be of guidance for this study. The patient sample in this study was evaluated following clinical recommendations , evaluating data emphasizing responder individuals as a subgroup, were efficacy results based on the descriptive statistics show statistical significant improvements for one of the two methods of attempting to monitor efficacy in this study. Based on the TSQ method there were 5 subgroup patients (out of 10) that responded to treatment at visit 4 and as many as 9 statistically significant improvements at visit 5 (follow-up). The single group crossover design of the study, i.e. participants first received treatment followed by a washout period acknowledge the sustained and increased improvements post-treatment as a clinically real effect different from placebo. Thus, the small patient sample confirms a significant time-consistency of the treatment also indicated by the 2 years follow-up with 3 of 9 patients reported asustainable relief. 3 patients showed an improvement in the tinnitus annoyance scale, and the descriptive statistics indicates a possible improvement over time, which is not confirmed by this small patient sample. Additionally, the effectiveness of tinnitus annoyance scalewas originally not developed and validated to maximize the sensitivity to treatmentrelated changes in tinnitus and to measure changes associated with the treatment. In non-responding patients with concurrent diseases the severity of the chronic condition aligned with self-perceptive mechanisms may temporary increase the intrusiveness aggravated by associated symptomatic emotional factors according to a transient “healing crisis” or cleansing like reaction . The reaction, which has been described in treatment of tinnitus in depressive patients , is characterized by an intensification of the disease symptoms and often an expansion of similar symptoms to other places all of a temporary nature, after which the patient is improved or well. It is well known in clinical practice that some patients may feel increased tinnitus tone in the beginning of a treatment and this is similar to the mode of action when patients are treated with for example anti-depressive drugs when the symptoms increase for some days and then decrease. The quality of life and sleep initiation time did not show significant changes. The evaluation time for these factors may have been too short to see changes. The safety evaluation did not present any safety concerns. The related dermal reactions were of mild intensity and were resolved within one day after end of treatment. The related increased tinnitus occurred early, within the first 6 days of treatment and resolved within 2 days after stopping the treatment. The study showed that the non-invasive dermal patch is safe and has proven to relieve tinnitus, measured as a decrease in TSQ score, for 50% (5/10) of the treated patients at end of treatment (visit 4) and for 90% (9/10) at visit 5. It indicates that it can be reasonable to recommend on a risk-benefit and safety perspective treatment with the patch to patients with tinnitus as a consumer product based on the lack of other effective alternative treatment. However, this should be considered as a small pilot study. Further and larger studies, and also proven experience, are recommended for stronger evidence. It can be discussed if these studies should be randomized controlled or not. Also how the patch affects the auditory system at cell level is unknown and needs to be further investigated. Baguley D, McFerran D, Hall D. Tinnitus. Lancet. 2013;382:1600-7. Davis A, El Rafaie A. Epidemiology of tinnitus. RS Tyler, editor. Tinnitus handbook. Singular, Thomson Learning, San Diego. 2000:1-23. Nondahl DM, Cruickshanks KJ, Huang GH, Klein BE, Klein R, Nieto FJ et al. Tinnitus and its risk factors in the Beaver Dam Offspring Study. Int J Audiol. 2011;50:313-20. McKenna L, Hallam RS, Hinchcliffe R. The prevalence of psychological disturbance in neuro-otology outpatients. Clin Otolaryngol Allied Sci. 1991;16:452-6. Möller AR. Tinnitus: presence and future. Prog Brain Res. 2007;166:3-16. Rauschecker JP, Leaver AM, Mühlau M. Tuning out the noise: limbic-auditory interactions in tinnitus. Neuron. 2010;66:819-26. Weisz N, Müller S, Schlee W, Dohrmann K, Hartmann T, Elbert T. The neural code of auditory phantom perception. J Neurosci. 2007; 27:1479-84. Kaltenbach JA, Afman CE. Hyperactivity in the dorsal cochlear nucleus after intense sound exposure and its resemblance to tone-evoked activity: a physiological model for tinnitus. Hear Res. 2000;140:165-72. Gangi S, Johansson O. Skin changes in screen dermatitis versus classical UV and ionising radiationrelated damage-similarities and differences. Experiment Dermatol. 1997;6:283-91. Kaplan S, Kaplan R. The experience of nature: Psychological experience. New York: Cambridge university press, 1989. Hobson J, Chisholm E, El Refaie A. Sound therapy (masking) in the management of tinnitus in adults. Cochrane Database of Systematic Reviews. 2012;11. Baldo P, Doree C, Molin P, McFerran D, Cecco S. Antidepressants for patients with tinnitus. Cochrane Database of Systematic Reviews 2012;9. Hoekstra CEL, Rynja SP, van Zanten GA, Rovers MM. Anticonvulsants for tinnitus. Cochrane Database of Systematic Reviews 2011;7. Hilton MP, Zimmermann EF, Hunt WT. Ginkgo biloba for tinnitus. Cochrane Database of Systematic Reviews 2013, Issue 3. Martinez-Devesa P, Perera R, Theodoulou M, Waddell A. Cognitive behavioural therapy for tinnitus. Cochrane Database of Systematic Reviews 2010;9. Phillips JS, McFerran D. Tinnitus Retraining Therapy (TRT) for tinnitus. Cochrane Database of Systematic Reviews 2010;3. Folmer RL, Theodoroff SM, Martin WH, Shi Y. Experimental, controversial, and futuristic treatments for chronic tinnitus. J Am Acad Audiol. 2014;25(1):106-25. Johansson B, Sukhotskaya S. Allometric scaling behaviour – A quantum dissipative state implies a reduction in thermal infrared emission and fractal ordering in distilled water. Water 2012;3:100-21. Regional Ethical Review Board in Stockholm. Ethical Approval Registration No. 2010/1233-31. Tyler RS, Oleson J, Noble W, Coelho C, Ji H. Clinical trials for tinnitus. Study populations, designs, measurement variables, and data analysis. Prog Brain Res. 2007;166:499-509. A community for measuring health outcomes using SF tools. www.sf-36.org. Prigogine I, Nicolis G. Selforganisation in non-equilibrium systems, from dissipative structures to order through fluctuations. New York: Wiley;1977;90-160. Brizhik L, Del Giudice E, Jörgensen SE, Marchettini N, Tiezzi E. The role of electromagnetic potentials in the evolutionary dynamics of ecosystems. Eco Model. 2009;220:1865-69. Marchettini N, Del Giudice E, Voeikov V, Tiezzi E. Water: A medium where dissipative structures are produced by coherent dynamics. J Theor Biol. 2010;265:511-6. Boström H, Dahlgren H. Placebo. SBU nummer 154, 2000. Swedish Government Report. Statens beredning för medicinsk utvärdering (SBU) och Liber AB. Meeus O, De Ridder D, Van de Heyning P. Administration of the combination Clonazepam-Deanxit as treatment for tinnitus. Otol Neurotol 2011;32(4):701-9. Meikle MB, Stewart BJ, Greist SE, Martin WH, Henry JA, Abrams HB, et al. Assessment of tinnitus: measurement of treatment outcomes. Prog Brain Res. 2007;166: 511-521. Langguth B, Salvi R, A Elgoyhen. Emerging pharmacotherapy of tinnitus. Expert Opin Emerging Drugs. 2009;14:687-702. Gunnarsdottir TJ, Jonsdottir H. Healing crisis in reflexology. Compl Ther Clin Pract. 2010;16: 239-43. Holgers KM. Tinnitusbehandling styrs av etiologin. Buller, stress eller ångest/depression tänkbara orsaker. Läkartidningen. 2003;100:3744-9. Paper submitted to the ITJ-EM (Editorial Manager System) on June 18, 2016; and accepted on January 06, 2017.